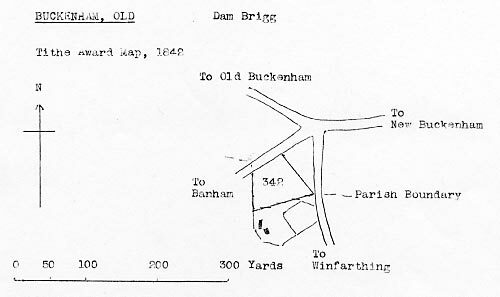 Old Buckenham Dam Brigg postmill stood to the southeast of New Buckenham just inside the Old Buckenham side of the boundary, with the Mill House on the Banham side. 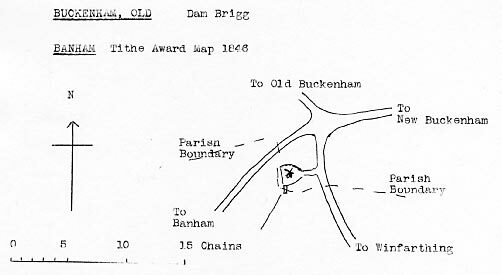 The map shows Dam Brigg postmill just over the boundary into old Buckenham. However, part of the house and garden are just inside the Banham boundary. On the right of Dambrigg stood another Post Mill, latterly the property of Mr.Smith but he also ground with a small steam mill in later years. The old mill seems to have been pulled down between 1910 and the first Great War.